YOUR CALL TO CTHULHU IS IMPORTANT TO US. PLEASE HOLD. Red tape. Catch-22s. Circular chains of command. Whether you're a customer or co-worker, bureaucracies drive us all insane. Even management is just a cog in a vast machine. Information, items, and even people get lost in the system, never gone but never found. No one seems to notice the insanity surrounding them... or if they do, they keep it to themselves. After all, those who notice and call attention to it tend to disappear, leaving nothing behind but an empty desk and whispered rumors in the break room. If ever there was a place for a cosmic horror to hide, grow, and thrive, it's deep within the archives of a huge, old bureaucracy. But of all bureaucracies, corporations are the most powerful, seeming to have a life and will of their own. They're privately held with a multi-national reach, seemingly bottomless resources, and armies of lawyers jealously guarding their trade secrets. Corporate culture fiercely resists any attempt to change or regulate it, and anything and everything is justified by the bottom line. 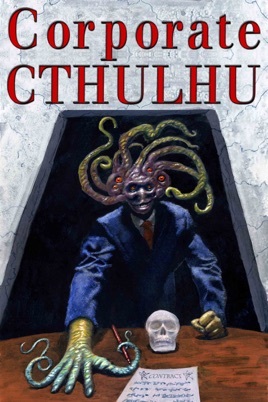 Who needs a Cthulhu Cult when you've got Cthulhu, Inc.? Into this insidious world are thrust our heroes - the curious, the puzzled, and the frustrated. Defying authority, seeking answers they'd be better off not knowing, the secrets they discover threaten their sanity and their lives. Will they become the next whistleblower media hero? Or the next no-call / no-show their coworkers promptly forget? Just remember: it's nothing personal - it's just business.